Josh Padilla wears No. 71 on game days. He is listed as a senior kicker on Leyden’s roster. He is a team captain and walks to midfield for the pregame coin toss. Then he’s done for the day. A player who doesn’t play. A kicker who doesn’t kick. A guy on the sidelines. 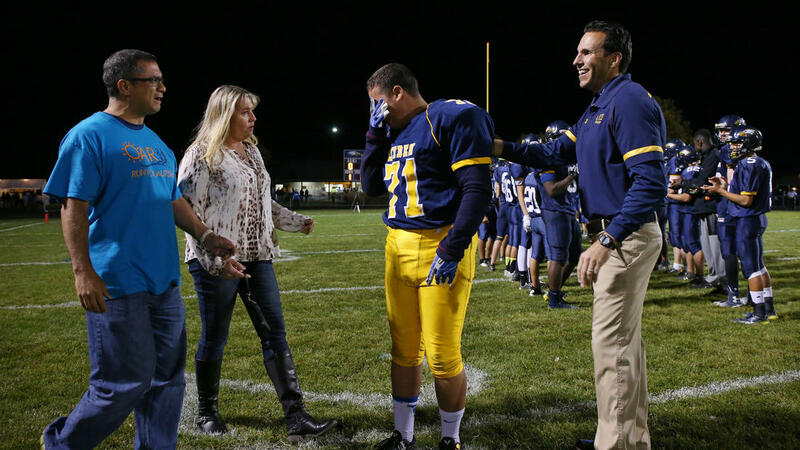 But Friday night (Oct. 24, 2014), Josh became the guy with autism who scored a touchdown on senior night. On a set play after the opening kickoff, Josh took a shuttle pass from quarterback Tom Pajor and ran 66 yards to the end zone. Josh’s parents, Dan and Kim Padilla, teared up in the Leyden stands as the entire Eagles team mobbed their son. The play came as a surprise to most fans in attendance. The Proviso East coaching staff agreed to the play. The Eagles practiced for Josh’s big moment all week. 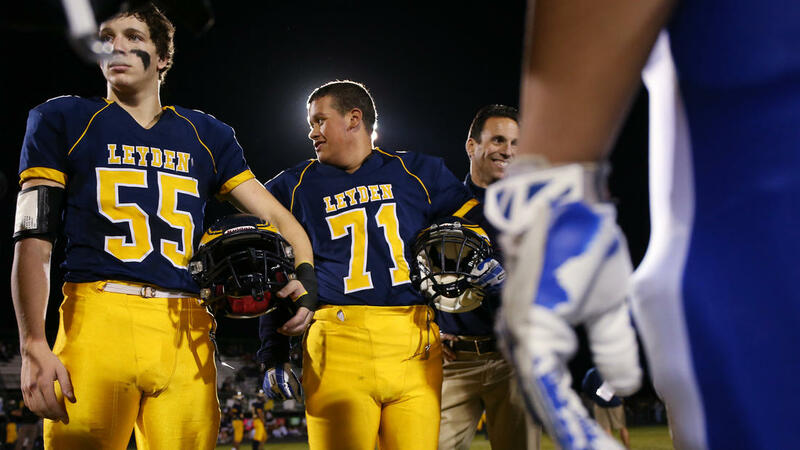 Josh’s touchdown did not go on the scoreboard, but the play set the pace for Leyden’s 49-9 victory. Before the game, Josh ran onto the field during senior introductions and began to cry as he gave coach Tom Cerasani a bear hug. Kim Padilla said Josh was overwhelmed by the attention and told her he was sad football was coming to an end. 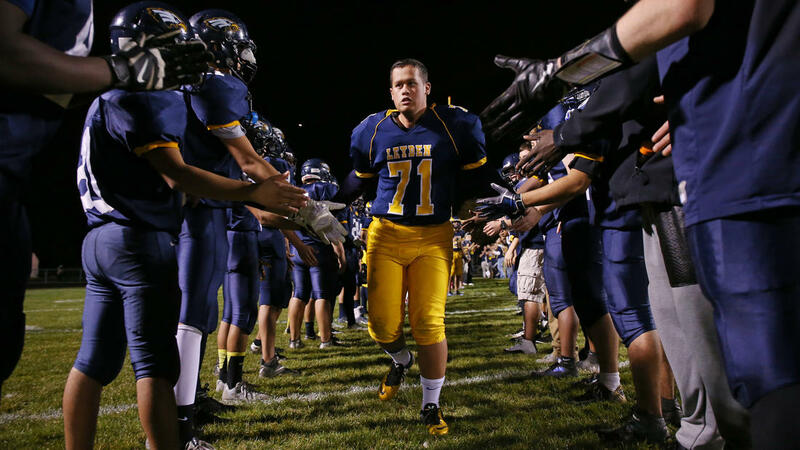 Josh Padilla rides the bus with teammates each weekday to practice at East Leyden High School. On a cloudy and cool Thursday, Josh, a senior at West Leyden, was first off the bus. He took long, deliberate strides to the school’s front door, which he held open, smiling as he waited for lagging teammates. He then moseyed onto the field, poking Pajor under the ribs. He held his helmet and gloves in his left hand and wore Nike cleats and a faded No. 46 practice jersey. Josh was born June 10, 1997, as Kim’s only child. Dan had two children from a previous marriage. Dan, outspoken and confident, thought his son inherited his wife’s calm demeanor. He didn’t suspect autism, not even when a pediatrician recommended speech therapy, which was unsuccessful. Still, Kim scheduled an appointment with a neurologist, who needed only a few minutes to diagnose Josh with autism. Autism spectrum disorder affects about one in 68 American children, according to the Centers for Disease Control, and boys are five times more likely to have the disorder. Kim Padilla said Josh’s autism falls in the middle of the spectrum. An athlete and youth coach, Dan suggested Josh join the football team his freshman year. 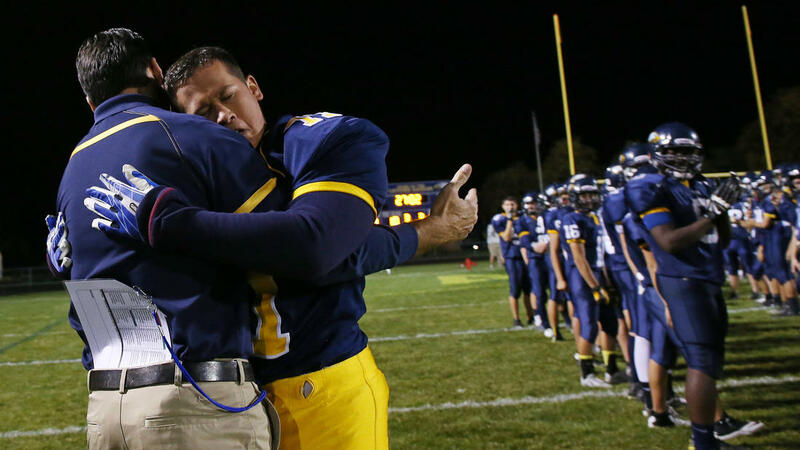 He knew his son might never play, but he wanted him to be more than the water boy or equipment manager. Josh needed to be part of the team. 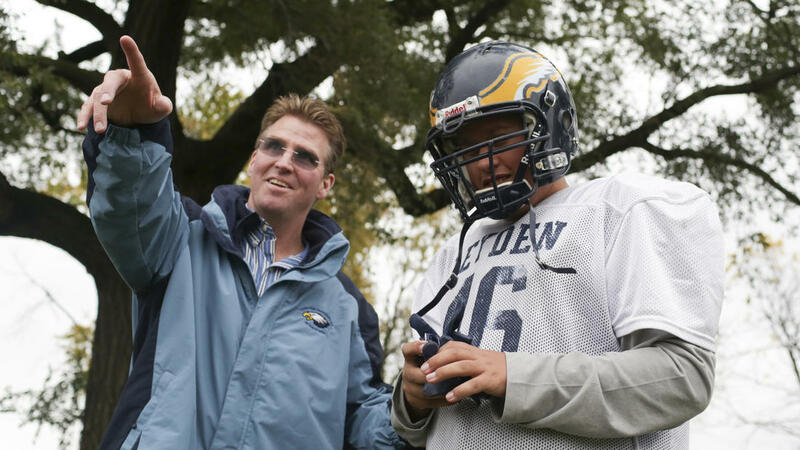 Longtime West Leyden special education teacher and Eagles baseball coach Gary Wolf said he could not remember another student like Josh participating in a mainstream team sport. Dan took time off his job as a state housing investigator to make sure Josh was comfortable at the start of the 2011 freshman football season, but he returned to work after a couple of days of watching Josh stand closer to the fence than to his new teammates. So Josh kicked off to start a half of a freshman game, with the permission of the opposing coach. His sophomore year he did it again, this time without Leyden’s opponent knowing about his autism. That kick traveled only a few yards, but a teammate was assigned as his personal protector. Last fall, varsity coach Cerasani was skeptical of allowing Josh to participate because of the inherent dangers of football. 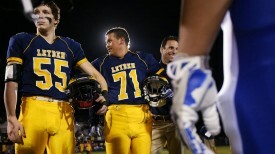 Friday marked the first time Josh played in a varsity game. Josh balked when after-school special educator Kevin Summerville wanted to play catch on the sideline, but eventually he agreed. He dropped the first two short passes but caught the next four. “I’m watching you, Josh,” receiver Alex Lemon said as he pointed two fingers at his eyes, then rotated his hand to point at Josh. Josh mimicked the gesture and briefly made eye contact with Lemon, one of the few times he looked directly at anyone during the practice. Next year there will be no football for Josh. He’ll enter a post-high school life skills program, likely through Leyden schools or Elmhurst College, aimed at job readiness. But for one final Friday night, Josh was one of the guys. 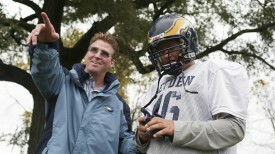 Dan Padilla said Josh has been more comfortable playing football than participating in the Special Olympics. Josh’s special education math teacher had trouble reaching him in a classroom, but Josh opened up on the field.